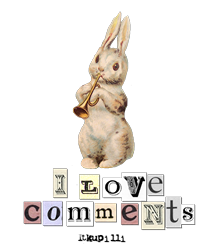 One of my daughters has a blog which, unless you are an avid gamer, you won’t be subscribed to. I am a follower but only to show support as I don’t understand what she’s talking about half the time not having played computer games since they phased out Space Invaders. I am therefore not qualified to make comments on her post but usually press the ‘Like’ button as it amuses me to see my little house avatar in amongst the ‘cool’ ones of the gamers. ‘The Dragon’s Tea Party’ blog. Both my daughters are addicted to tea – I blame myself although it could be worse. They aren’t dragons though – just to be clear. 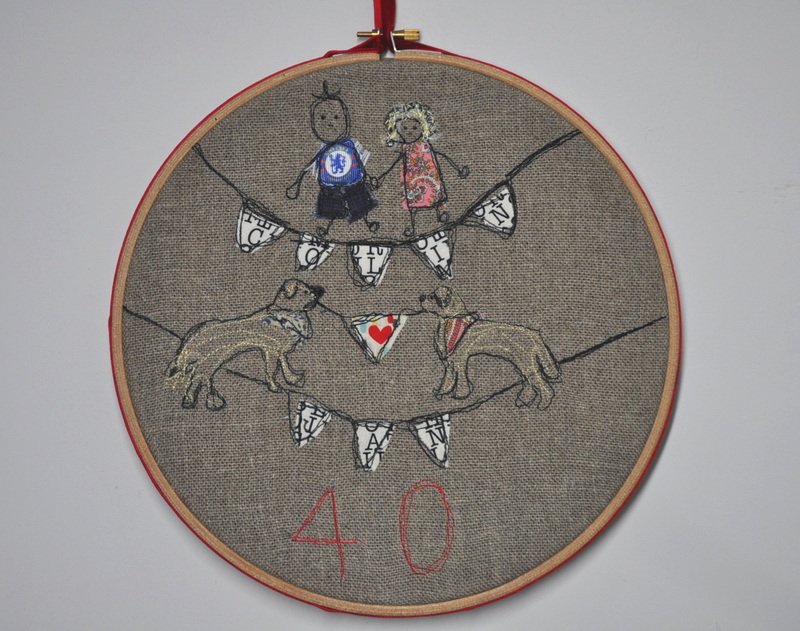 So, as a little housewarming gift, I dropped my feed dogs, attached the darning needle and came up with this. 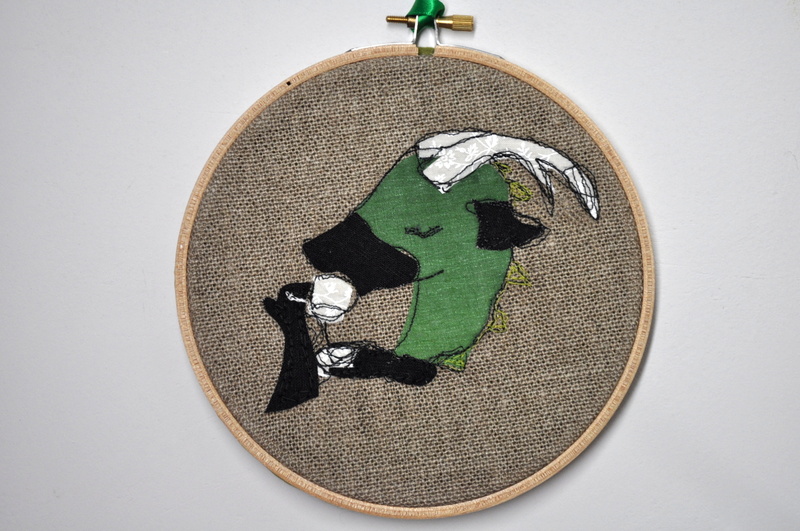 I was going to attempt the freehand embroidering of the name of the blog too but I was so pleased with the dragon I didn’t want to push my luck in case it all went pear shaped. I’ve used more fabric that I usually do so it’s a bit more freehand machine appliqué than freehand machine embroidery but I wanted to get the green colour just right. 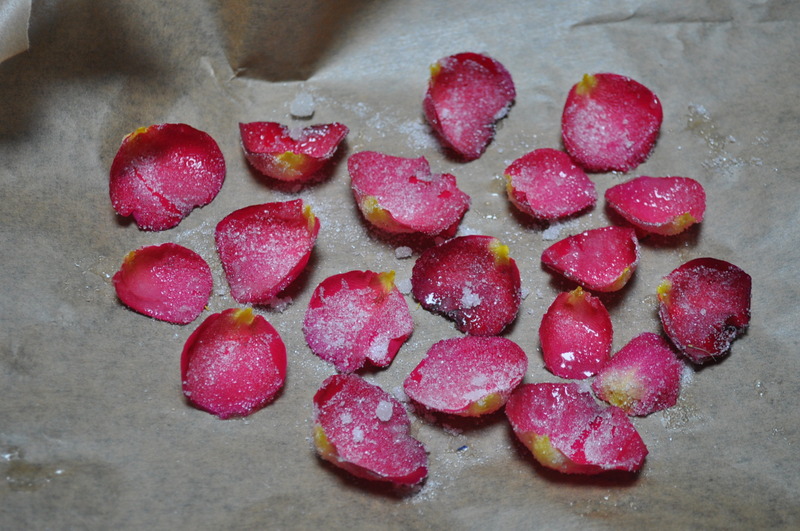 I think I have said on this blog before that life is too short to stuff a mushroom but, evidently, it’s not too short to paint rose petals with egg white and dust them with sugar. Why, I hear you ask, were you engaging in the sort of shenanigans usually only bothered with by celebrity chefs and contestants in baking competitions? Because I was making a dessert for a Ruby Wedding celebration is my answer and I thought it appropriate to have red rose petals sprinkled artfully over and around said dessert. Well – they were definitely red to start with but after a brush with the egg white they turned a pinker shade of red. No matter – they were pretty anyway and I move even closer to my Domestic Goddess status . Some friends of ours were celebrating 40 years of marriage – and look! they’re still laughing. 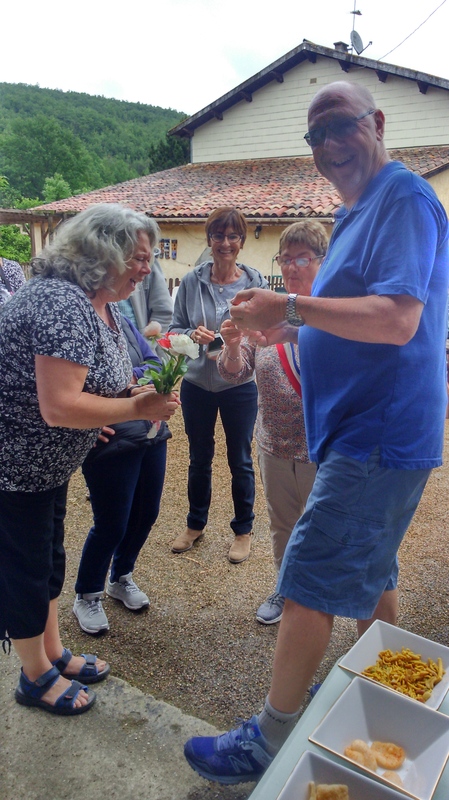 A mixture of French and Brits were present to help them celebrate and, of course, being a Ruby Wedding Anniversary, there had to be a Ruby Murray on offer. Firstly because you can’t get a decent curry here for love nor money unless you make your own , secondly because we are Brits and we have to have curry occasionally in order to survive and what better excuse than when the name is in both titles? For those not in the know a ‘Ruby Murray’ is cockney rhyming slang for a curry. The occasion demanded another foray into my new passion for freehand machine embroidery. Colin is a massive Chelsea Football fan and so I had to portray him wearing something with the crest on it and Jan has got a gorgeous mass of curly hair. They are dog lovers and have a particular soft spot for golden retrievers which they generally find in re-homing centres and so they had to be in the picture too. I must perfect my dog breed representation but you get the drift. I was gratified to see that, despite not having seen my gift at that point, Colin had dressed to match it. 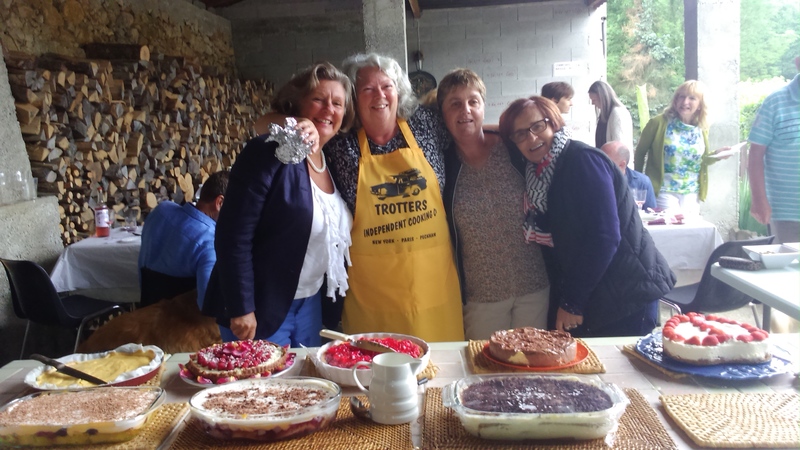 So, I didn’t have to undo any stitching and the French friends and neighbours present at the ‘do’ all happily went along with our quaint foreign ways anyway – even sampling the curry! 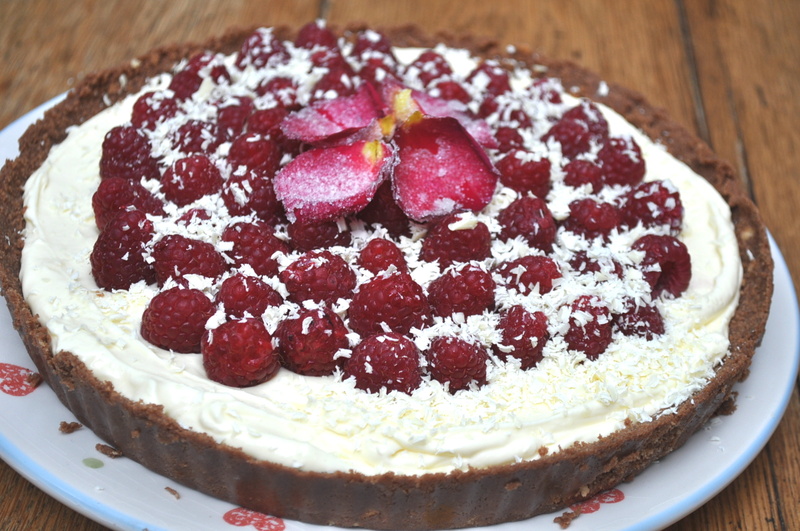 Anyway, back to the rose petals which I used to adorn a fruit tart – my contribution to the dessert table. If I tell you it was an adaptation of a Nigella Lawson recipe it won’t surprise you to know that it probably didn’t do anybody’s cholesterol levels any favours. 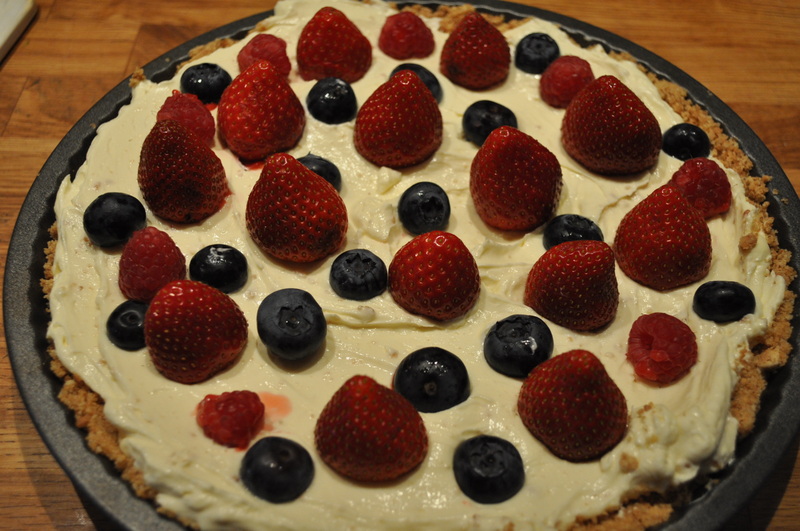 Originally a black and white tart – using blackberries and whitecurrants – this was, once again, from her ‘How To Be A Domestic Goddess’ book which is now my go to bible for puddings/cakes and other wickedness having rediscovered it on my bookshelves recently. The digestive biscuit base was ‘enhanced’ by a spoonful of cocoa powder and the mascarpone filling was ‘further enhanced’ by some melted white chocolate, the remainder of which was grated on top (well, most of the remainder, some might have found its way elsewhere 😉 ) Anyway, I think it was good but, by the time I got up to the dessert table, it had all gone. I should have nabbed a slice instead of taking photos 😦 Luckily, I have made it once before, without the cocoa and the white chocolate and I know that version was good and, as it so happens I have a photo of it too, albeit taken on my phone in artificial light. Is It Mothers’ Day Where You Are? It’s not the Fetes de Mères (Mothers’ Day) in France until the end of May but as my Mum is English and in England, today is Mothers’ Day as far as I’m concerned. Also, since Mlle. Tialys the elder lives back in the U.K. now, I only stand a chance of being remembered on Mothers’ Day if we stick to the U.K. one because she will see all the palaver surrounding it beforehand and remind her sister who is still in France and would otherwise be blissfully unaware of it. Who better than your mother to practice on when indulging your new sewing passion? Unfortunately, even though my crochet hook has been a blur, I didn’t manage to finish the blanket I was hoping to give her for Mothers’ Day but, being my Mum, I’m sure she’ll forgive me. Remember the Stitching Santa organised by Sewchet I participated in last Christmas? When I received my goodies from Pippa at Beads and Barnacles she included this turquoise drawstring pouch. I was thinking I could use it to keep my current small crochet project in and saw another opportunity to practice the freehand machine embroidery I’ve become keen on. Just the right size for keeping my Fusion quilt squares in which, as you can see, is progressing slowly but surely, one square at a time. The yellow thread started out as a representation of a slip knot. It went a bit awry but you get my drift. It can hang on my pinboard which I am very happy with as a way of keeping my tools and other bits off the surfaces but within easy reach. I have two of these side by side and painted them duck egg blue to go with the woodwork on the top floor of my house which is where my sewing room is. A craft fair next Saturday? Sounds like another opportunity for some freehand machine embroidery I hear you say – and, of course, being a fund raiser for a retirement home for unwanted old and disabled dogs, it had to have some sort of pooch on it. Much as I love the effect of the stitches against linen, this was a complete pain to thread the flex frame through at the top due to the linen itself being thick, plus a layer of fusible fleece and a cotton lining. So this will be unique in the true sense of the word and not in the sense of ‘rare’ or ‘unusual’ which seems to be in common usage these days because I really am only making one of them. I am going to rope in Mr. T and see if we can work out a way to make the channel at the top somehow separate from the body so I don’t have to go through all the thicknesses. I’ve seen one done like this but the channel was not the full width of the case, and I prefer it if it is, so maybe I could adapt that. Meanwhile, so far today – it’s 09.20 – I took Mr. T. a cuppa in bed and said ‘Happy Mother’s Day’ in what I hope was a sarcastic manner, although I know I’m not his mother. There is no sign of a card anywhere nor email nor text from the U.K. nor from the room at the end of the corridor where Mlle. Tialys the Younger will doubtless remain entombed until around 1300h, which is her usual habit of a Sunday. I’ll let you know if things change. There was a lot of staggering and muttering ( and very possibly a lot of husband/father involvement) and these appeared. The morning staggering was even more pronounced than usual as we forgot to put the clocks forward last night so time was confused. I must confess to a nostalgia for the early days when I got a cup of tea and croissant brought up to me in bed, a flower out of the garden on the tray and hand made cards with masterpieces such as this within. Not the most flattering of images conjured up of me there but I’m guessing the rhyme was the important thing.